Update 12th January - the course is now fully booked. Our beginners' course is back for 2019 by popular demand! Whether you are a complete beginner or have some experience already, this is a great opportunity to learn new skills, improve your knowledge, gain confidence and make new friends. 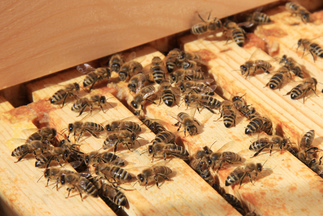 Our aim is that by the end of the course you will feel confident to keep your own colony of bees. The course is suitable for adults aged 16+. All participants will be paired with an experienced ‘bee buddy’ to help them with their first colony of bees. There will be continued access to the Association Apiaries on completion of the course and beginners are encouraged to attend further sessions to improve their beekeeping knowledge and experience in handling live bees. The course fee is £102. You must be a full individual member of the HDBKA to join the course - membership costs £28 and can be purchased alongside the course booking below. The course is limited to 20 students due to classroom capacity and to ensure we can provide adequate post-course support to our new bee keepers. Sorry, this course is now fully booked. If you wish to add your name to our reserve list, please use the contact form below. Request to join the Reserve List for the 2019 Beginners' course.